Understanding the processes underlying the transition from introduction to naturalisation and spread is an important goal of invasion ecology. Release from pests and pathogens in association with capacity for rapid growth are thought to confer an advantage for species in novel regions. We assessed leaf herbivory and leaf-level traits associated with growth strategy in the native and exotic ranges of 13 invasive plant species from 256 populations. Species were native to either the Western Cape region of South Africa, south-western Australia, or south-eastern Australia and had been introduced to at least one of the other regions or to New Zealand. We tested for evidence of herbivore release and shifts in leaf traits between native and exotic ranges of the 13 species. Across all species, leaf herbivory, specific leaf area and leaf area were significantly different between native and exotic ranges while there were no significant differences across the 13 species found for leaf mass, assimilation rate, dark respiration or foliar nitrogen. 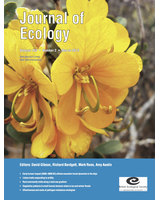 Analysis at the species- and region-level showed that eight out of 13 species had reduced leaf herbivory in at least one exotic region compared to its native range. Six out of 13 species had significantly larger specific leaf area (SLA) in at least one exotic range region and 5 of those 6 species experienced reduced leaf herbivory. Increases in SLA were underpinned by increases in leaf area rather than reductions in leaf mass. No species showed differences in the direction of trait shifts from the native range between different exotic regions. This suggests that the driver of selection on these traits in the exotic range is consistent across regions, and hence is most likely to be associated with factors linked with introduction to a novel environment, such as release from leaf herbivory, rather than with particular environmental conditions. Synthesis: These results provide evidence that introduction of a plant species into a novel environment commonly results in a reduction in the top-down constraint imposed by herbivores on growth, allowing plants to shift towards a faster growth strategy which may result in an increase in population size and spread and consequently to invasive success.